With its handsome aluminum trim and wood or high-grade Formica finish, our High Roller Blackjack Table is like nothing else you'll find on the market. Each High Roller Blackjack Table is hand-crafted to your specifications. The Table comes standard with a metal chip tray and money slot, a professional quality layout, inset jumbo drink holders, and a comfortable padded arm rest. The High Roller Blackjack Table measures 84" x 46" (Custom Blackjack Table sizes are available). You can choose from a wide range of wood stain colors, including Mahogany, Ebony, Walnut, Cherry, Natural, and more. For tables with a Formica finish, we offer Cherry, Dark Walnut, Mariner Burl Blue, Red Burl, and many others. We also offer a broad selection of vinyl arm rest colors, such as Black, Blue, Red, Cream, and Burgundy. Standard and Customized Blackjack Layouts are available. For more information on our High Roller Casino Blackjack Tables, please contact us at 1-800-233-0828. 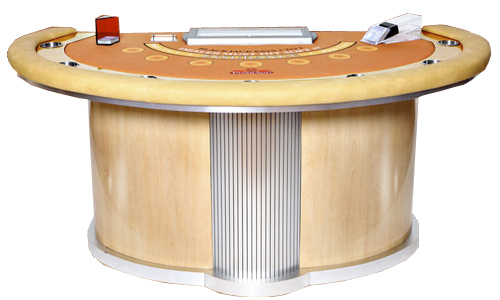 You might also be interested in viewing our wide selection of other Casino Blackjack Tables, which are all hand crafted in the United States from top-of-the-line materials.